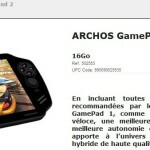 Announced for the end of October 2013, the ARCHOS GamePad 2 (model with 8 Gb storage) started to sell on ARCHOS online store in time. The portable game console has been available for a short period until the store shown “Out of stock! Next shipment second week of December“. 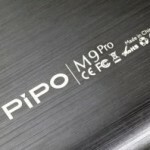 ARCHOS history on product launch, it is still uncertain if this delay could be met and when the console will be available thru other channels. 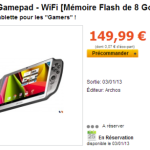 ARCHOS France announced a few weeks ago on Twitter that the 16 GB model won’t be available before 2014. Compared to the GamePad 2, the JXD S7800b portable Android game console offers similar features for less money. We are currently comparing both models and should soon be able to provide a side by side comparison. The main issue on the ARCHOS GamePad2 is a relatively poor processor performance, mainly on the graphic processor (GPU) side. Sure it can execute most current games, but they won’t run at full frame rate and coming games that require a high performance device will probably give hard time with the GamePad 2. We have done a quick benchmark comparing the performance between an Nexus 7 (2013) vs the ARCHOS GamePad2 on 3DMark benchmark v1.2.0.1232 – Ice Storm Extreme. 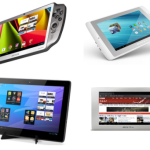 High performance tablets like the Google Nexus 7 (2013) with an additional controller are interesting replacements for the ARCHOS portable console.